KASHGAR: The future of economic development in China’s far western Xinjiang region lies behind the shattered glass door of a welcome centre on the outskirts of the ancient Silk Road city of Kashgar. Inside, a dusty model depicts a modern urban development with wide, tree-lined boulevards and a pair of twin skyscrapers — but outside the project remains a ghost town reflecting Beijing’s struggle to bring prosperity to the restless region. Dubbed “Shenzhen City” after the bustling southern port city that financed it, the more than 200,000 square metre development is part of a government project to stabilise Xinjiang with massive economic stimulus. Beijing has paired promises of wealth with strict controls on personal and religious freedoms in an effort to quell ethnic strife between the country’s Han Chinese majority and the region’s mostly Muslim Uighur minority. The landmark buildings’ half-finished silhouettes jut out of a rubble-strewn construction site, surrounded by withered trees and grass. Several such ambitious projects around Kashgar have stagnated despite government plans to bring the poverty-stricken region’s economy on par with the rest of the nation. To do so, Shenzhen and 18 of the country’s other wealthiest cities and provinces have been required to pump a fraction of their GDP into Xinjiang under a “pairing assistance” programme. The rationale is “if you can improve people’s economic conditions, they will become less politically restive,” said Enze Han, a lecturer on politics at the University of London’s School of Oriental and African Studies. But “if you look at the ground, the story in Xinjiang is a failure,” he said. In 2010, a year after deadly riots in Xinjiang’s capital Urumqi killed around 200 people, authorities rolled out the “pairing assistance” programme to raise the region’s per capita GDP to the national average within five years. 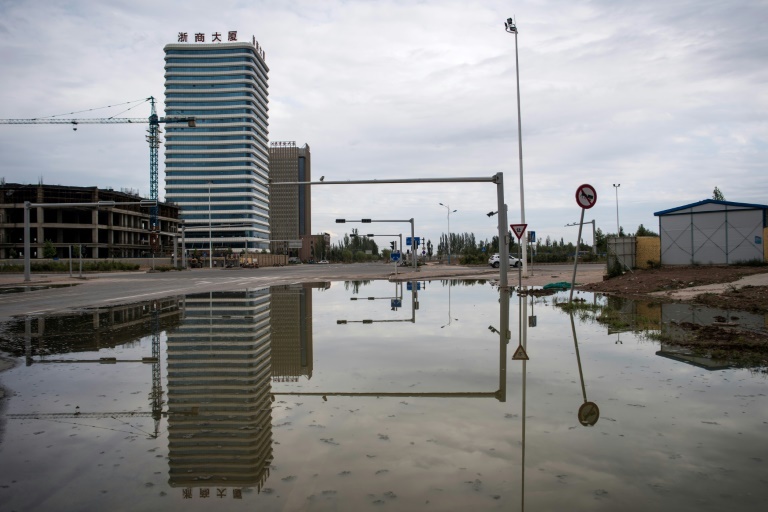 Another project lies largely abandoned across town: Guangzhou New City, a 1.5 million square metre “urban centre” in suburban Kashgar funded by the wealthy southern province of the same name. In late June, Michael Jackson music blared from speakers around the complex, where rubbish piled up in front of empty store fronts covered in fading “for rent” signs. Toilets in the men’s bathroom were still wrapped in their original cellophane. When the development opened in 2012, promotional materials promised 20,000 jobs and housing for up to 80,000 people, roughly 15 percent of Kashgar’s population. Shenzhen City was stopped because its “prospects were not good,” a project manager surnamed Yang told AFP without elaborating. But a 2014 prospectus by the Shum Yip Group, a company involved in the development, said “frequent terrorist violence” made it difficult to attract labour or businesses. “Some shops have closed because of Kashgar’s stability maintenance problems,” said Zou Zebin, the owner of a high-end furniture store, one of the few remaining shops in Guangzhou New City. Xinjiang’s ever stricter security may also be negatively affecting businesses, according to Adrian Zenz, an expert on Chinese security at Germany’s European School of Culture and Theology. “Regular businesses and manufacturing there are no longer competitive due to the added expenses caused by security measures,” he said. But Zou believes the “cities” can still replicate their namesakes’ success, as Kashgar is a key part of China’s One Belt, One Road initiative, a massive global infrastructure project to revive the ancient Silk Road.